The distance between two points is the length of a straight line segment between them. In the case of two locations on Earth, usually the distance along the surface is meant: either "as the crow flies" (along a great circle) or by road, railroad, etc. Distance is sometimes expressed in terms of the time to cover it, for example walking or by car (see distance covered). Sometimes a distance thus indicated is ambiguous because the means of transport is neither mentioned nor obvious. As opposed to a position coordinate, a distance can not be negative. Distance is a scalar quantity, containing only a magnitude, whereas displacement is an equivalent vector quantity containing both magnitude and direction. The distance covered by a person, vehicle (often recorded by a odometer), animal, object, etc. should be distinguished from the distance from starting point to end point, even if latter is taken to mean e.g. 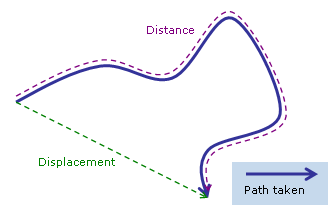 the shortest distance, because a detour could be made, and the end point can even coincide with the starting point. Generated on 4/22/2019 12:05:14 PM (PST) ADI/HQ/GBA/2019/ARIELCLOUD/v3.0.2018.0126.